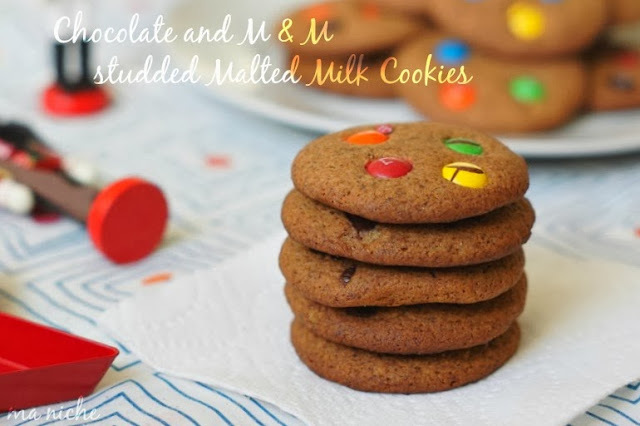 I had bookmarked these malted cookies from Bake for Happy Kids. The recipe there is an adaption of Pioneer Woman's Malted Milk Chocochip Cookies. Like Zoe I used Horlicks in place of malted milk powder and then tweaked the original recipe further by substituting all-purpose flour with whole wheat flour and the chocochips with an assortment of M & M's and pieces of dark chocolate. The final cookie was nice, snappy and addictive. 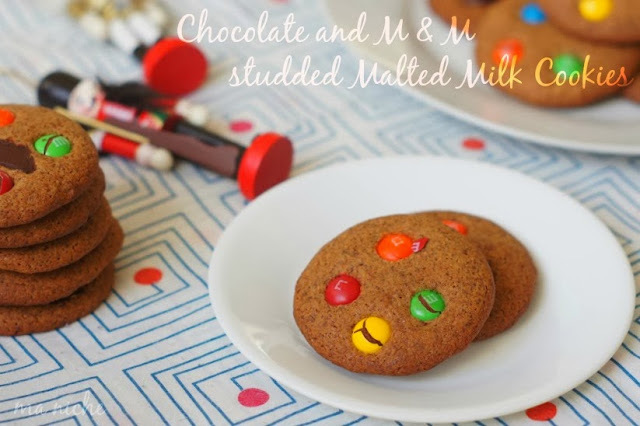 They were a hit even with my toddler and our friend's preschooler so can safely be labeled as kid-friendly ! Line 2 baking sheets with parchment paper and preheat oven to 375 degrees F.
Cream the butter, add sugar to it and beat until it is well combined. Add the egg and vanilla extract to the mixture and beat till the mixture becomes creamy and fluffy. Add the Horlicks or malted milk powder into the butter mixture and beat it is well incorporated. Now sift the flour together with the baking soda and salt oven the butter-Horlicks mixture, then gently fold it into the butter until just combined. Scoop out one tablespoon of the mixture at a time, shape it into flattened disc and place 1 1/2 inch apart on the prepared baking trays. 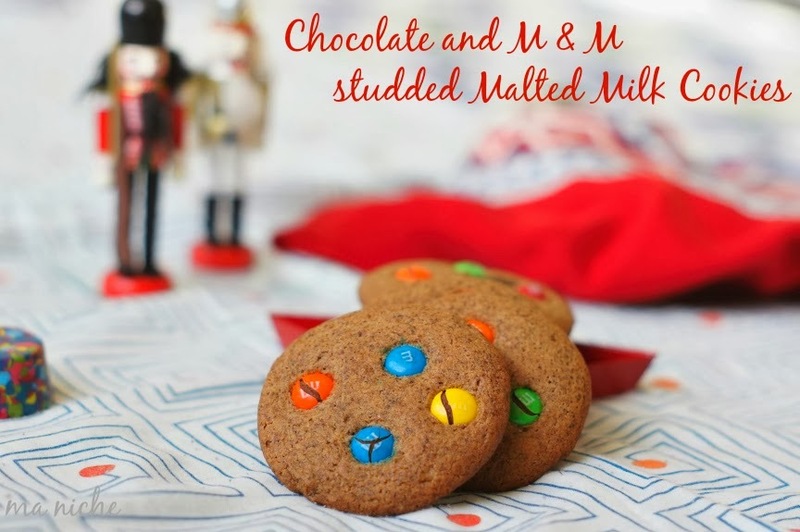 Press enough M & Ms and chocolate chips into each disc and bake in preheated oven for 10 minutes. In case you prefer more chewy cookies, substitute half of the light brown with granulated sugar, use 1/4 cup of Horlicks instead of 1/3 cup and for lesser time. Great and delicious cookies. Perfectly baked and crisp. Healthy tasty and perfectly baked cookies. Look lovely with M&Ms. Delicious and beautiful Mm cookies love it. oh wow so perfectly baked cookie , they look beautiful and crunchy ! !